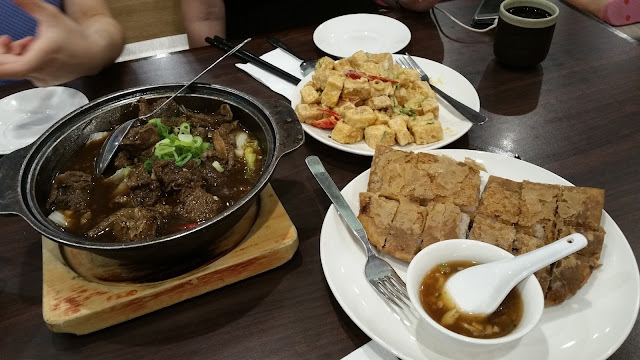 Weekend girls night out, a couple of friends and I wanted to check out something new, since one of our companions had never tried out Taiwanese food before, we thought it a nice opportunity to introduce her to one of my favourite cuisines. 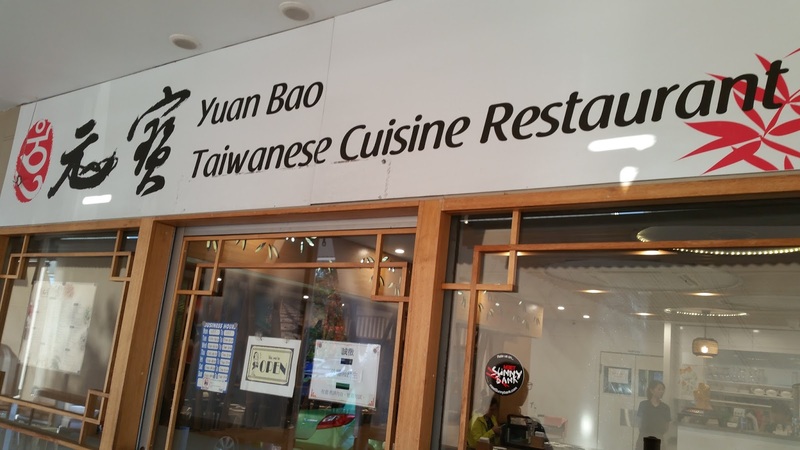 Thus we decided to head to Yuan Bao at Pinelands Sunnybank Hills. The interior had a decidedly bamboo theme. 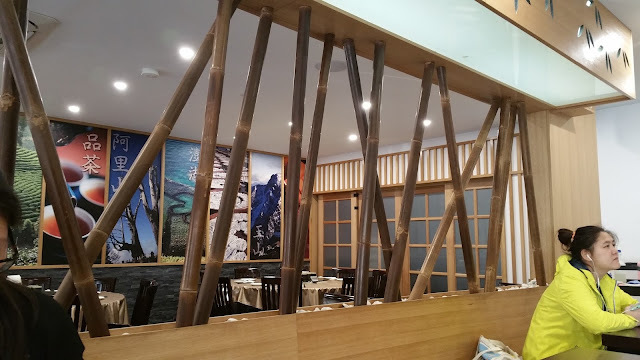 My companion did raise the question of why this would be here and not in a Japanese restaurant, but I reminded her that bamboo was a theme that ran across quite a few Asian cultures. Perhaps we arrived early, but there were quite a few seats which filled up after our arrival. 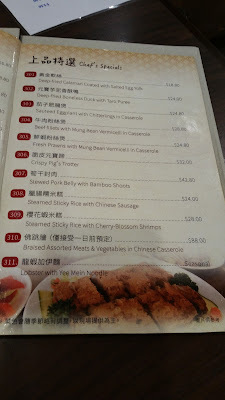 Akin to Chinese restaurants, the menu was designed to share with rice, and sorted by the main type of ingredient in the dish, e.g. chicken, beef, pork. We made our order with differentiation in mind and waited for our food. 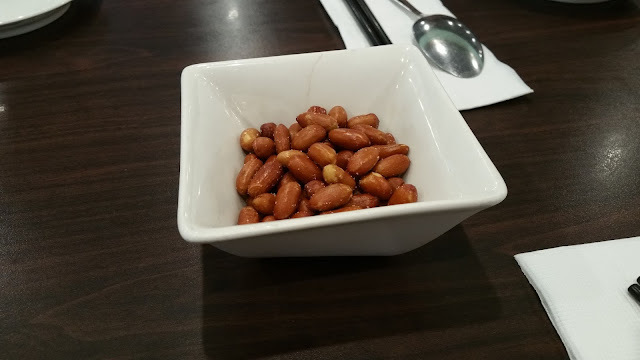 Complimentary peanuts were soon served and they were roasted to a crisp and lightly salted. An enjoyable appetizer for all. Keeping entertained by the peanuts, our food came before long. 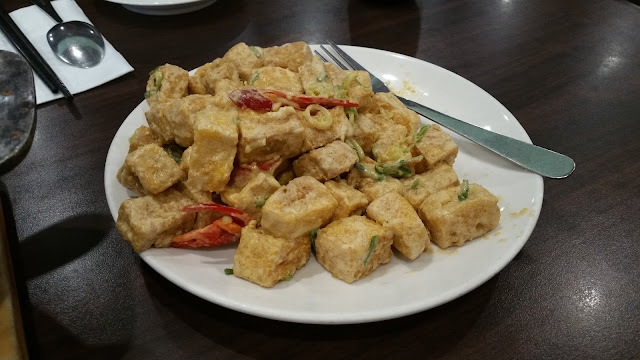 This was the deep fried tofu with salty egg yolk batter. Extremely tasty but notoriously bad for health, the skin was crispy and the inside deliciously fluffy. The egg yolk added a salty powdery texture, and the chillies weren't spicy but contributed considerable fragrance. 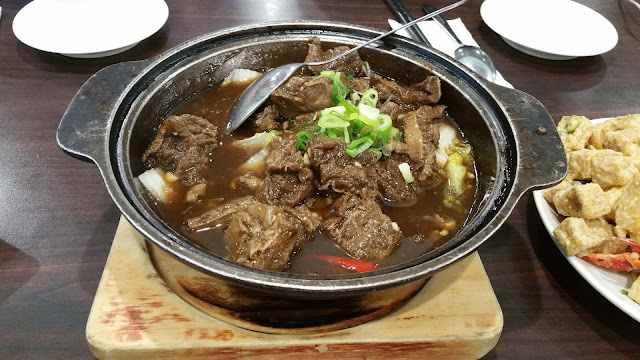 Next we had the stewed beef pot. This was quite a comforting dish, with a dark soy base and tender chunks of beef brisket, along with some chopped Chinese cabbage at the bottom, it reminded me of mums cooking. 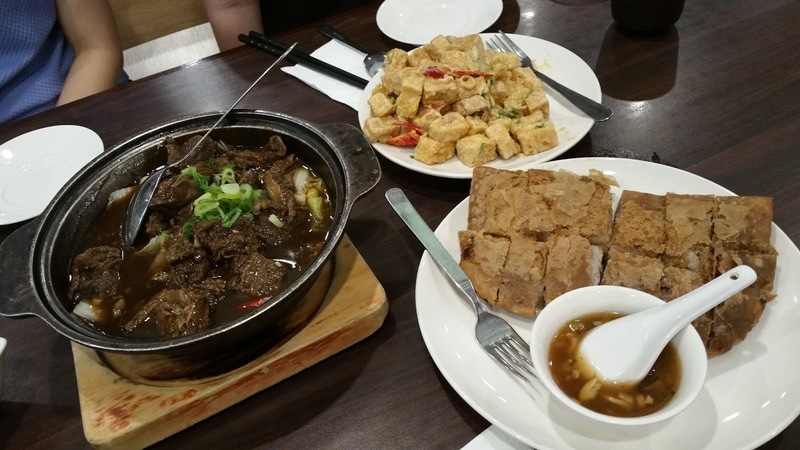 Like the tofu, this was executed quite well with the sauce not being too salty and the beef which melted in my mouth. 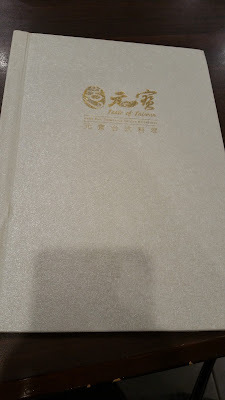 Our last main, which I had forgotten to take an individual photo of as I was too busy eating, was my favourite, Taro Duck. Having had it in countless Taiwanese Restaurants, it usually consists of taro paste wrapped around a roast duck fillet and deep fried. Whilst this was mostly complied to, the duck was hand shredded send folded inside the taro, which detracted a bit from my experience, although the taro was well seasoned and deliciously crunchy. 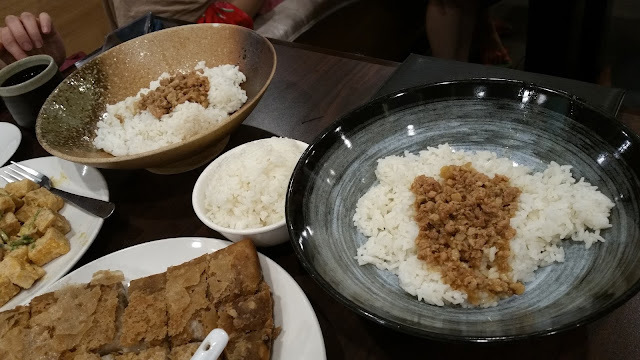 In terms of rice, friends would know that I cannot go past a Taiwanese pork mince rice, which is what I had of course. 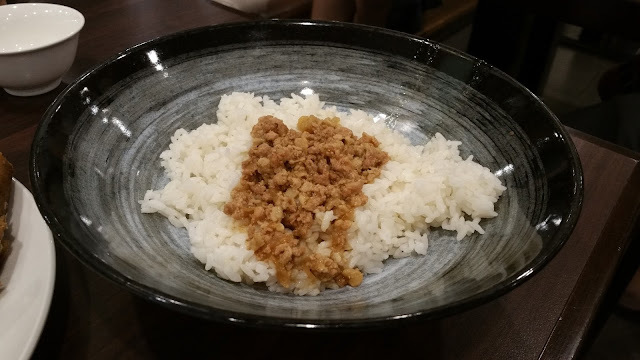 The rice was my preferred short grain, giving up the fragrance of long grain Jasmine and in turn getting a smooth exterior and exceptionally good texture inside. It went unbelievably well with the pork mince, which was quite oily and lightly salted.